If you have ever wondered about how to train the lats then look no further. This article is 100% about training the lats. Bonus material includes a beginning to advanced program. 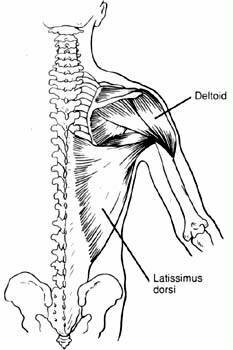 The lats - or latissimus dorsi - is the large, triangular muscles that extend from under the shoulders down to the small of the back - the "wings". The lats are the largest upper body muscles. Their basic function is to pull the shoulders down and back. While the lats usually tie in around the waist, some people seem to have lats that are "high", that is, they tie in to the body much higher up that they should. While this is largely genetic, close grip pull-down and close grip rows will help. Good lat width is definitely one of the most important physique qualities any aspiring bodybuilder could work for. The V- shape that makes a bodybuilder look like a bodybuilder cannot happen without well developed lats. Of course, a tight trim waist and wide delts are critical to the V shape but that's another article. In bodybuilding competition, one of the great poses is the rear lat spread - Ronnie Coleman won last year's Olympia on that one pose. Some of the most exciting moments on stage happen when a top bodybuilder slowly opens their lats to their full width! I remember seeing Franco Columbo and Lee Haney both do this - you just didn't think they could get any wider! Another great back pose is the rear double biceps - one of the all time best in this pose was Arnold - there's a picture of him in "Education of a Bodybuilder" doing this pose in 1974 - not only do his lats help make the pose with a perfect "V" look but he had the first lower back "Christmas tree" I remember never seeing that on a top bodybuilder. I personally think that back shot stands up to anyone from any era. Many people, when training lats, think only of the pull-down function for width. But the lats, and the back as a whole, needs to be thick, so rows must be included. Look at the function of the lats again - they pull the shoulders down - pull-down - and they also pull them back, as in rowing movements. You have to do both if you want great lats. You can use different grip widths to get a different feel to the exercise. It used to be thought that the wider the grip, the wider your lats could become, that no longer is thought to be the case. A medium wide grip works well for most people - on a typical lat bar, this is right where the bar begins to curve downward. As I said above, close grips will help with "high lats". Deadlifts - this exercise can effectively hit the lats: when you pull up on the bar, start your pull with the lats, and let your lats lead through out the movement. In fact, this is the trick to good back development: do not pull with your arms, pull with your back. Your arms should be thought of as hooks, nothing more. This may take practice for some people. One good way to do that is to stand and grab a stationary object, and pull; start the pull in the lats. You need to feel this in the lats and back as a whole before you can transfer this to effective back workouts. Deadlifts - 1 warm up set, 1 working set of 8 reps.
Chins - work up to 25 reps. Most beginners are warmed up by the time they get to back, as they should really start with squats and work logically into back, biceps, chest, delts, triceps, forearms and abs in that order. When performing dead lifts, it is smart however to do a warm up set. Remember, it's an easy set, not a work set! If you are a beginner, be sure you add weight as often as you can, like every few workouts. That 8th rep should always be very difficult to complete, if it's easy then you need to add weight to the bar. This is called progressive resistance and is one of the keys to getting bigger. How do you tell if you are ready for intermediate training? If your beginner routine has become much easier, if you have made strength gains, if you have gained muscle size and weight, if you have at least 6 months of training under your belt, it's time to move on. Deadlifts - 2-3 warm up sets, add weight, decrease reps with each set. Example - set 1 100 lbs., 15 reps. Set 2 - 125 lbs., 12 reps. Set 3 - 175 lbs., 10 reps. Of course, the weights listed are just numbers, try to hit the rep guidelines using weights that allow you to hit those rep limits. Being warm up sets, do not make them to difficult. 2 -3 working sets of 6 - 8 reps, starting with your heaviest set. Fail at about 8 reps, do not push past failure. Bent rows - 1 warm up set of 12-15 reps, 2 working sets of 8 reps, failing at about 8. Chins - 50 reps. Do these as sets, do them all at once if you can, just hit 50 reps. You can choose lat pull-down if you want, 2 sets of 8 reps to failure. Your exercise choice here may depend on where you work out, what equipment you have access to and how strong you are. You should plan to change your exercises every 4-6 weeks, although I would not drop dead lifts. Deadlifts - 2-3 warmup sets, 3 working sets of 8 reps, fail at about 8 reps - this is true for each exercise. Once you begin to adjust to the workload in the above routine, and after about 1 year of training, you should be ready to move on. Hopefully, you have gained anywhere from 20-30 lbs. of muscle. Advanced training can mean a couple of things. If you want to compete, you should be thinking weak point training and balance among the muscle groups. If you do not want to compete, you still should strive for balance, but may decide not to correct weaker areas. This should also mean using intensity techniques to get better results from your training. I'm a big believer in using intensity techniques like forced reps, supersets, drop sets, rest pause and so on. One big reason to do this is your strength will plateau after a while. If you want to keep your workouts progressive, you have to increase intensity. Otherwise, you're just hitting the same weight for the same reps time after time after time. Doesn't make sense, does it? So, your back isn't wide enough? Add either 2 more sets of pull-down or 1 set of chins to the above routine. Try your pull-down form the rear, that is, with your back to the stack. Add drop sets to the pull-down and forced reps to the chins. Need thickness? Add 2 sets of bent rows to the above routine, try the rest pause technique. So you see, at this level, you need to analyze your development and go from there. While I would always do deadlifts, and do them first so you can go heavy on them, the next exercise you do should focus on the area you want to improve. Don't want to improve anything? Then add some intensity techniques to the above routine. Forced reps work great, personally I've always liked drop sets and rest pause. Either way, these techniques will bring you into a whole new level of training. Give these tips and routines a try and see how they work for you.